Oliver Hazard Perry’s victory in the Battle of Lake Erie caused the loss of the British fleet there in September, 1813. Then, in September 1814, Thomas Macdonough’s victory at the Battle of Plattsburgh on Lake Champlain caused the British, with French Canadian allies and financiers, and British arms makers, to fear that the Yankees might take Canada next. This beautifully colored print by William Charles shows King George III frantically baking more ships to replace those lost to American victories on the Great Lakes. It is a companion to John Bull and the Baltimoreans and Johnny Bull and the Alexandrians. [WAR OF 1812]. WILLIAM CHARLES. Print. 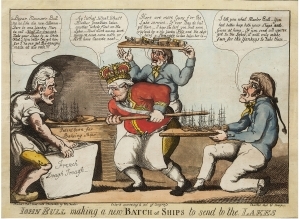 John Bull making a new Batch of Ships to send to the Lakes, engraved satirical aquatint cartoon. Philadelphia, [October, 1814]. 1 p., 12¾ x 9¼ in. Excellent condition. In May 1814, Thomas Macdonough Jr. (1783-1825), in command of U.S. naval forces on Lake Champlain, protected his fleet by transferring his guns to a shore battery that repelled the British squadron. Macdonough then transferred his squadron to Plattsburgh, New York, to await a British advance and defend the army of American General Alexander Macomb. On September 11, 9,000 British regulars under General George Prevost and a squadron of sixteen ships and gunboats under Captain George Downie began a combined assault. Macdonough had anchored his fleet in Plattsburgh Bay to force the British to engage at close range, where their firepower would be roughly equal. Downie sailed his ships into the bay. In early fighting, a broadside killed or wounded one-fifth of the crew of Macdonough’s flagship. But a few minutes later, an American shot exploded a British cannon, killing Downie. The two flagships dueled to a standstill, when Macdonough cut an anchor, spinning his ship around. Facing the undamaged guns on its port side, the British flagship and three other ships surrendered, while their gunboats withdrew. General Prevost realized he could not hold Plattsburgh without naval support and retreated into Canada. Taken with news of the nearly simultaneous defense of Baltimore, victory at Plattsburgh gave American negotiators at Ghent the power to successfully demand exclusive rights over Lake Champlain and shared rights to the Great Lakes. The cartoon also slyly references the capture by the Fox, a Portsmouth, New Hampshire, privateer, of the Quebec-bound HM transport Stranger on September 8, 1814. The Fox rerouted the captured ship to Salem, Massachusetts, depriving the British forces on Lake Ontario of 66 pieces of cannon, 300 boxes of ammunition, and blankets. Lanmon, Lorraine Welling, “American Caricature in the English Tradition: The Personal and Political Satires of William Charles,” article in Winterthur Portfolio, Vol. 11, 1976, pp. 1-51. OCLC locates only the AAS copy, but LOC’s online catalog shows a similar color example, and also mentions a black & white example.